The UC Santa Cruz sailboat "Maybe" captured the national championship for the Santana 22 one-design class in races on Monterey Bay. Phil Vandenberg, campus boating director for 35 years who retired in 2007, skippered “Maybe,” a Santana 22 that was donated to the UCSC sailing program, Joining him on the crew were Rusty Kingon, current boating supervisor, and Bob Simpkins, a longtime Santa Cruz sailor. 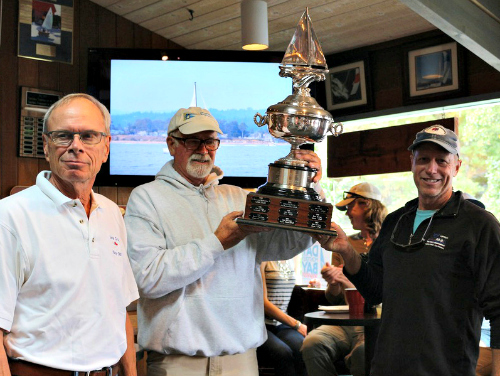 The Santana 22 class championships are held each year, rotating between Monterey, Santa Cruz, and San Francisco, said Kingon, who joined the UCSC sailing program in 2000 and became boating supervisor after Vandenberg’s retirement. “Maybe” is berthed at the UC Santa Cruz Community Boating Center located at the Santa Cruz Small Craft Harbor. Santa Cruz sailing legend Ernie Rideout and his wife Nancy donated the boat that was built in 1964 to UCSC in 2011. Rideout won previous national championships on “Maybe,” including 2006 and 2008 at ages 88 and 90. He died last year at 98. “This latest championship is a great tribute to Mr. Rideout,” Kingon said. The UC Santa Cruz Community Boating Center offers sailing classes throughout the year to both students and the local community. Kingon said the program just completed a 10-week session of mini classes for faculty, staff, alumni, and community members. 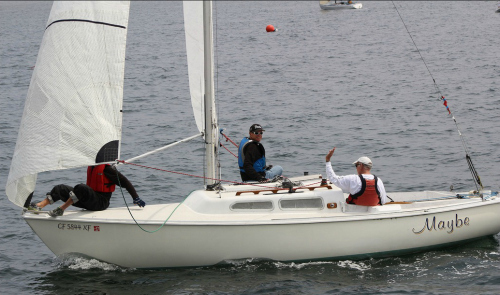 The UCSC fleet includes five keel boats, and FJ, Coronado, and Laser class boats.